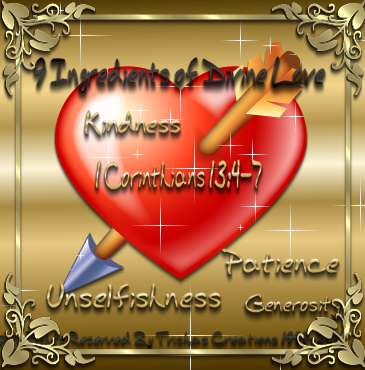 "9 Ingredients of Divine Love"
Welcome to "9 Ingredients of Divine Love"
You would be surprised, well maybe you wouldn't, but there are so many people who are being deceived, by their mates, their parents, their siblings, on what true loves is and how it is shown. Nowadays, we need to know the "TRUE" meaning of "LOVE" and how it is shown. There are even false prophets telling people that true love is shown by believing in someone who claims to be the Christ, and how to love Him. Hey... guys and gals...... There is 1 Jesus and 1 only and we are to Love Him with all our hearts and by loving Him we can love other's! 9. Sincerity -- Love in profession, never boastful, and conceited, not a hypocrite, always honest, leaves no impressions but what is strictly true, never self -assertive, does not blaze out in passionate anger, nor brood over wrongs, always just, joyful and truthful, knows how to be silent, full of trust always present.